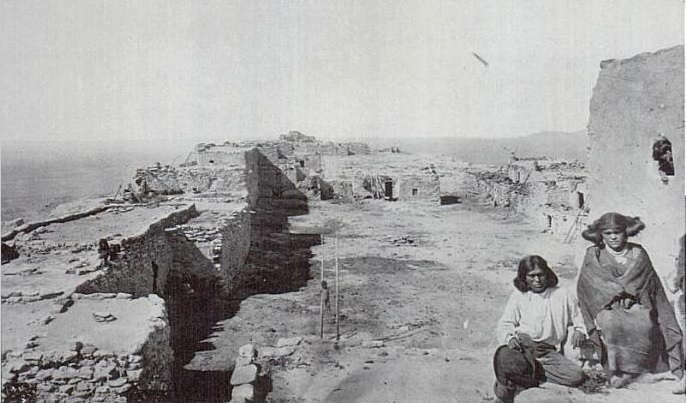 Iris Nampeyo was born around 1860 in Tewa Village at the base of First Mesa. Her mother was White Corn of the Hopi-Tewa Corn Clan, her father Quootsva, a member of the Hopi Snake Clan from nearby Walpi. The name "Iris" most likely was given her by someone working at the nearby Indian Health Services outpost. It was at Indian Health Services that she was diagnosed with trachoma, then an untreatable infection in the eyes that would eventually blind her. 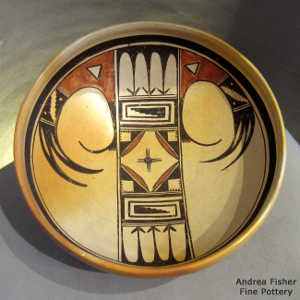 According to tradition, she was born into her mother's clan (the Corn Clan) and grew up under her mother's wing, although she learned the basics of traditional pottery making from her father's mother. In the late 1870's she was making money selling some of her creations through the local trading post operated by Thomas Keam over in Keam's Canyon. 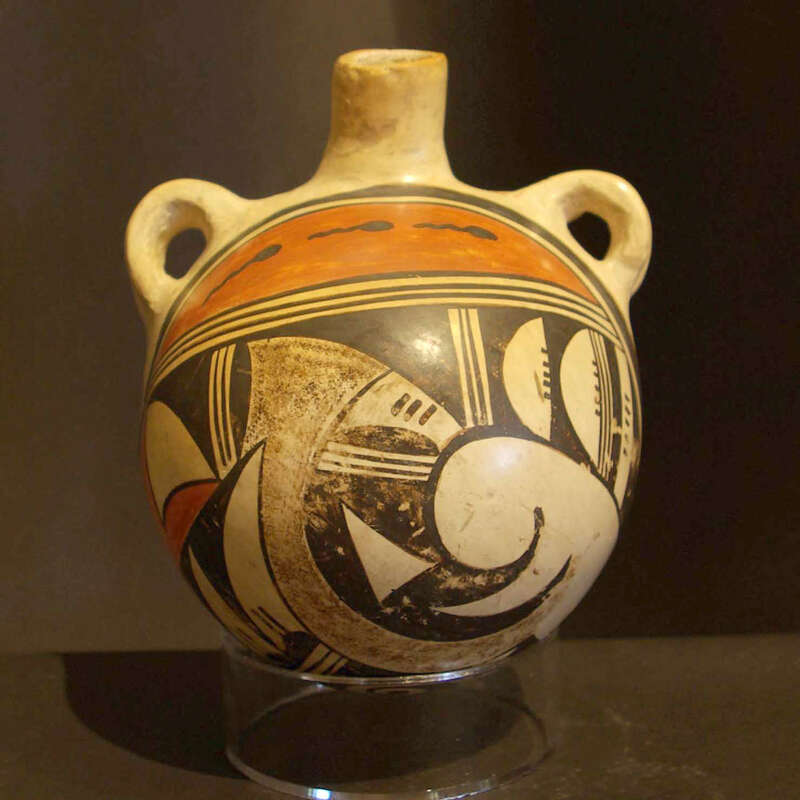 Around 1881 she was already a noted producer of Walpi Polychrome pottery when she married Lesou, her second husband. 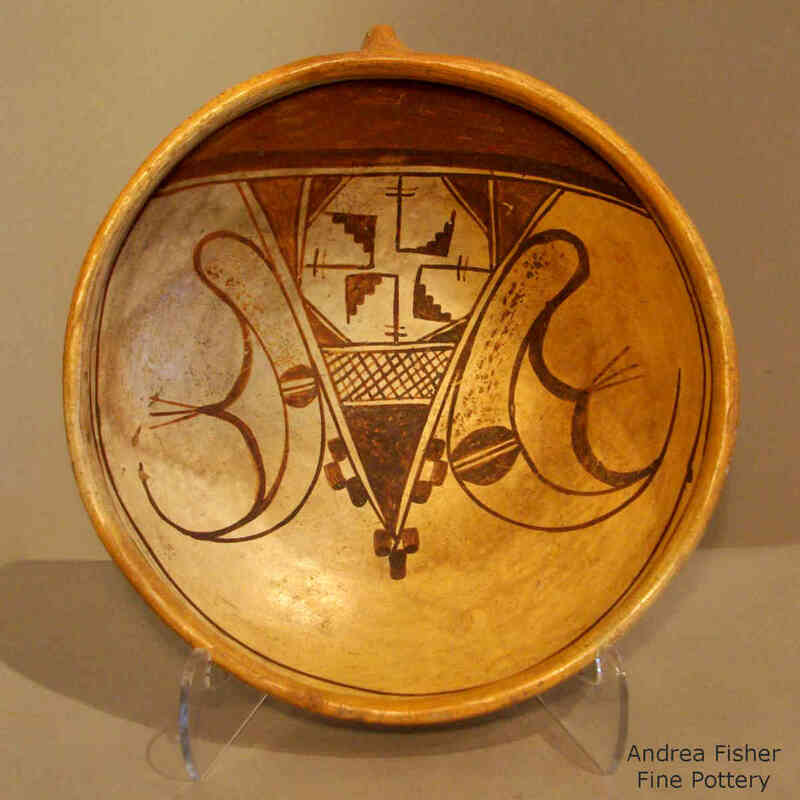 As time went on, she became increasingly interested in older and older Hopi pottery styles and designs. Her home was only a few miles from the ancient ruins of Sikyatki and she found abundant inspiration among the pot shards she found scattered throughout those ruins. She was good enough at her trade to be able to discern the multiple shapes and designs employed by those ancestral potters. It took her a while to find the clay source they had used, then more time to work the clay and learn to polish it to where decoration could be added to the bare clay body rather than over a thin slip. Eventually she got it right and her development of those styles and designs led to the Sikyatki-Revival style and that has led to a revival of the whole world of Hopi pottery. 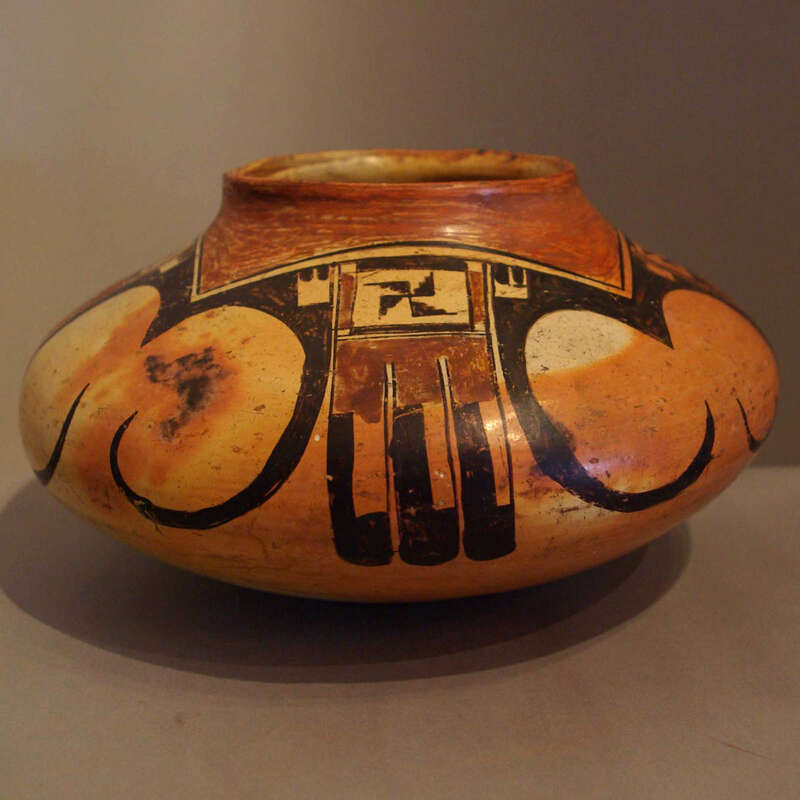 Nampeyo also prowled the sites of other ancient Hopi villages and found pot shards from other times and incorporated those, too, into her styles and designs. 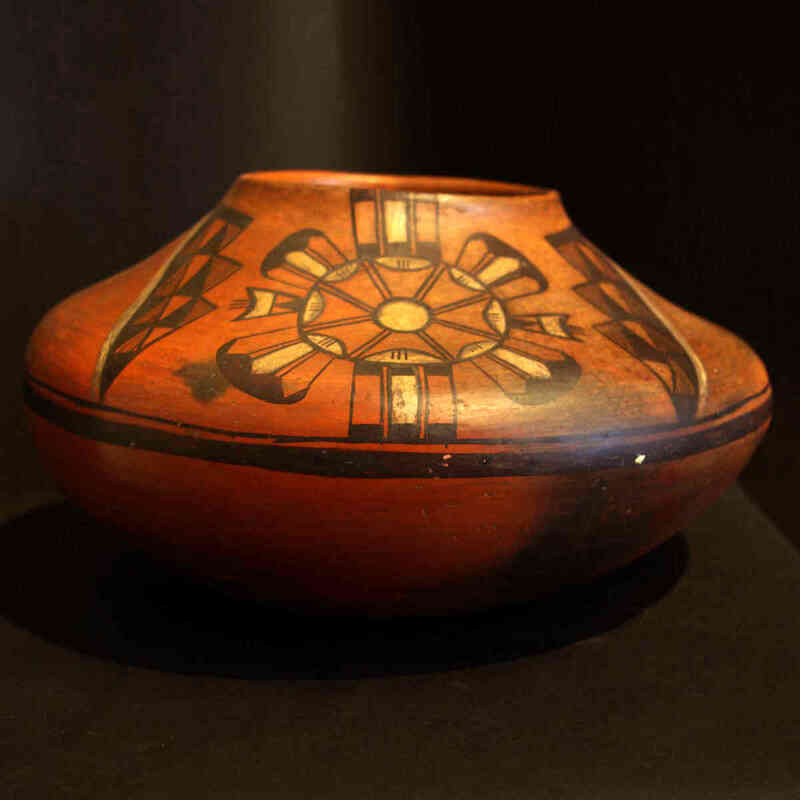 When the archaeologists came to First Mesa looking for potters to recreate the prehistoric pottery they'd found, Nampeyo was ready: she was particularly skillful in making her products and they were a commercial success, both in the US and abroad. 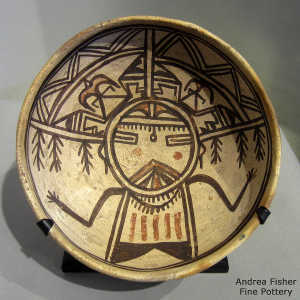 She also used other ancient Tewa techniques in the firing of her pots and in the processing of fired pots after firing. In the early 1890's, Jesse Walter Fewkes arrived and began his archaeological dig at the prehistoric village of Sikyatki and his workers found many old pots buried there, some whole, most broken but easy enough to reconstruct because all their pieces were together. As his expedition was financed by the benefactors of Harvard College, the vast majority of his findings were transported there and can now be found buried in the back rooms of the Peabody Museum. However, he also knew that Nampeyo's work was excellent for the time and was worried that her creations could become confused with those of the ancient potters. So he concocted a story that made it seem as though she had learned her methods, shapes and designs from his efforts... That story associated his name with hers and in some respects, his fame became tied to hers... But the physical evidence points to her producing Sikyatki-style pottery before Fewkes ever arrived in the area. It may also have been because of Fewkes that she became known as "Nampeyo of Hano." Hano was the name of a village that was built and abandoned before Nampeyo's Tewa ancestors came to Hopiland in the 1680's and began their settlement at what is now known as "Tewa Village." However, the Hopis who acted as interpreters for Fewkes insisted on using the name "Hano" for the entire area as Tewa Village was built very close to the ruins of Hano and it seems Hano had been built by Tewa migrants maybe 100 years before Tewa Village came to be. 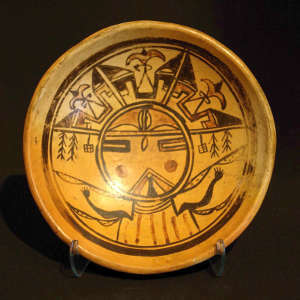 Nampeyo began losing her sight around 1900 and by 1925 was making her pottery completely by touch while her husband, daughters or other family members painted them for her. Her children: Annie (b. 1884), William Lesou (b. 1893), Nellie (b. 1896), Wesley (b. 1899), and Fannie (b. 1900). In Nampeyo's final years, Fannie was her primary painter. Around 1920 Fannie began signing the pottery she made with her mother as: "Nampeyo Fannie." Pottery she made by herself she signed "Fannie Nampeyo." When she died in 1942, Nampeyo was quite probably the most photographed woman in the Pueblo pottery world. She also left behind a large family of Hopi-Tewa potters that only seems to grow and improve with each generation.